Vrindavan and Mathura, India. December 2013. I left Varanasi on the luxury overnight Shiva Ganga express train, which, according to the schedule, was supposed to arrive to Delhi at 7.40 am. Dimi arrived to India the evening before, thus it made me even more impatient to reach the final stop. Morning arrival would also give us enough time to explore some Delhi sights, however, as apparently everything else, time has different value in India. I arrived to New Delhi Train Station only at 3.30 pm. 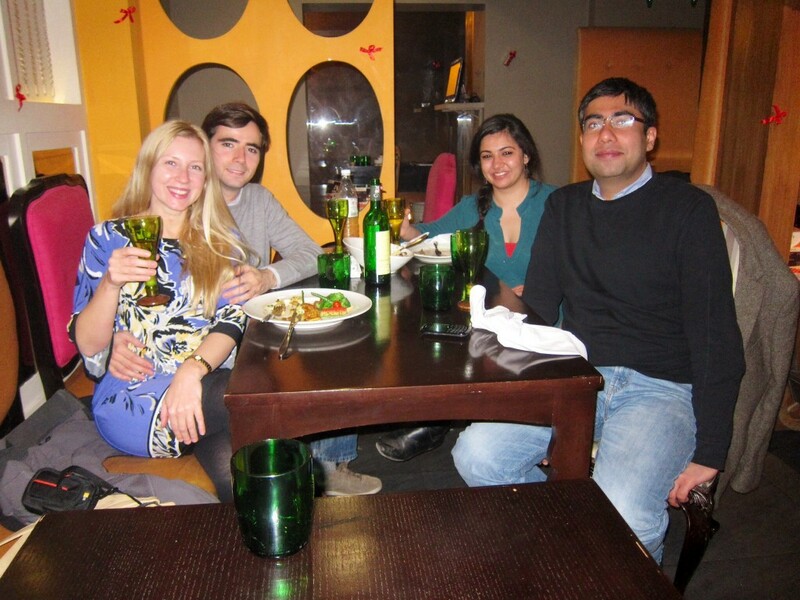 Having no time to explore the city, our friends Priyanka and Varun organized a very nice Indian/Lebanese dinner at Trolleys in Khan Market. 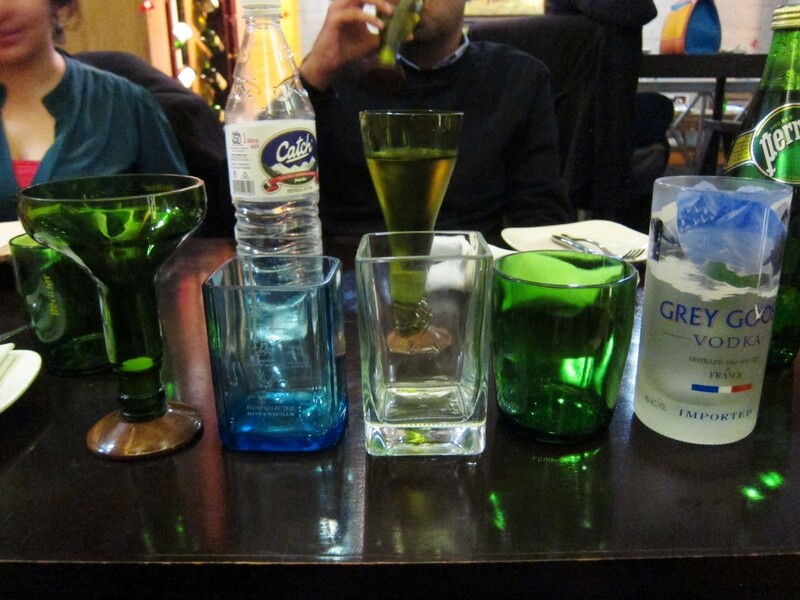 The restaurant’s owner, besides the main hospitality business, also was an entrepreneur, “recycling” used glass bottles into beautiful mugs and wine glasses. Impressed by the uniqueness of the product, we placed a few orders with his company – Reciclar. At 8 am, a car with a driver was waiting outside to take us to Mathura, Vrindavan and eventually to Agra. I hired Four Wheel Drive India Pvt, based on the reviews I read on tripadvisor. For two days of unlimited mileage and destination, all tolls and taxes included – Rs.10,000. Our driver was careful and very attentive; surprisingly, he neither spoke English nor knew the way to and around Mathura or Vrindavan, as he kept stoping and asking for directions every so often. Due to thick fog, descending on Delhi in winer months, we left on a journey much later than we planned, and by the time we reached Vrindavan, it was already noon. 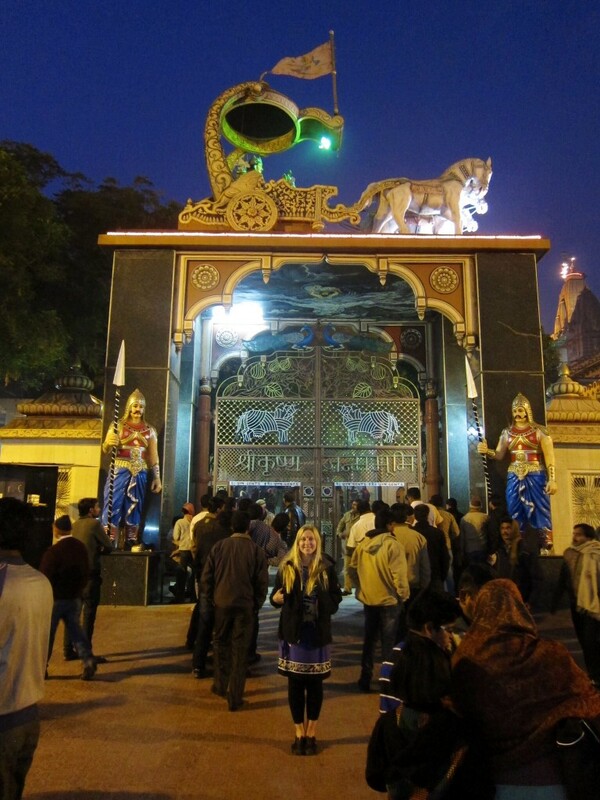 Both, Mathura and Vrindavan are intimately connected to one of the three main gods of Hinduism – Lord Krishna. 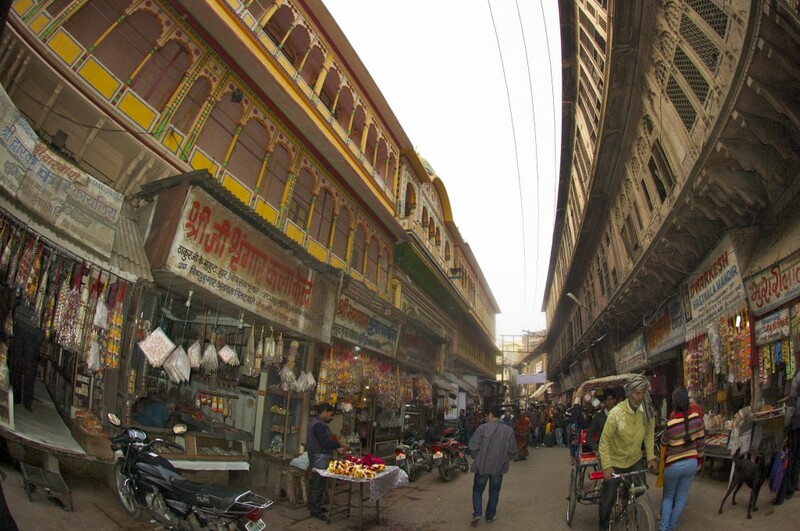 Mathura, is a place where Krishna was born, and Vrindavan is where he spent his childhood. They say that Krishna never leaves Vrindavan, thus it is a transcendental place and everybody who goes there become transcendentally purified. 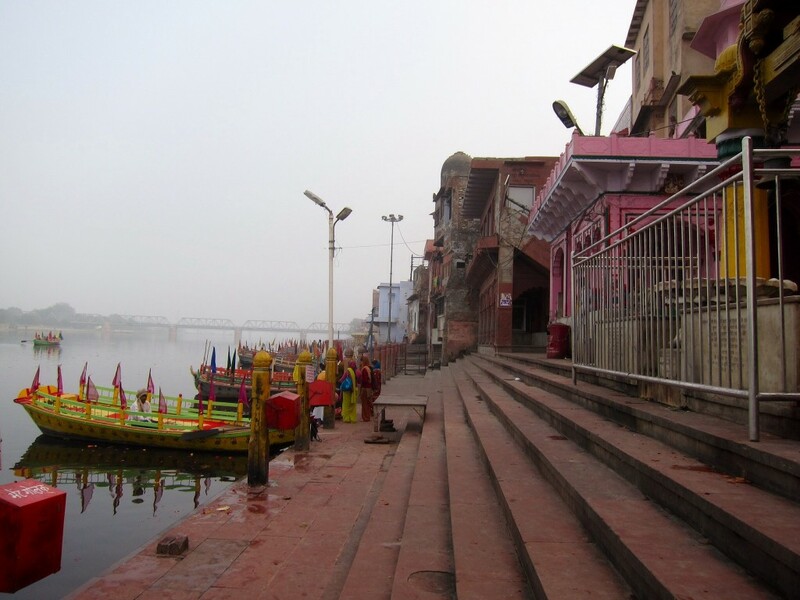 Vrindavan is an ancient place and an important pilgrimage site. It has over 5,000 temples but more importantly, it hosts the world’s largest Hare Krishna community with many millions of devotees of Radha Krishna visiting this place every year. Instead of usual “Nameste”, you hear “Hare Krishna” as a greeting and farewell. 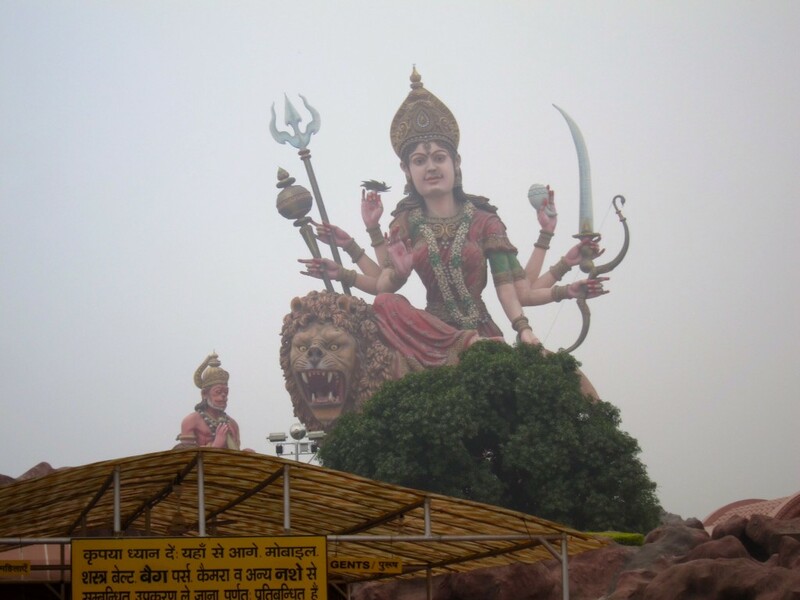 Because all temples in both Vrindavan and Mathura are closed between noon and 4 pm, we arrived in time to check out only Maa Vaishno Devi Ashram, more religious Disney Park than a temple, with a huge God sitting on the top of the mountain. Inside, after completing a long walk around the artificially created underground caves, we were given the tikas and lucky coins to take with us. Further into the town, we stopped by the famous ISKCON temple (Krishna Balaram Temple), which is accessed by the beautiful marble gate, serving as a tomb of Swami Pradhupada (1896-1977), the founder of the Hare Krishna Organization. The Temple also serves as the International Society for Krishna Consciousness which explains large number of Western people, including Russians, wandering around the premises. After paying our respect to the deity of the temple (and being asked for Rs.1000 donation) we were ushered out, because the temple was closing for a break. Outside, by the book stalls, a Russian vendor struck up a conversation with me. She was an interesting lady from St. Petersburg who moved to Vrindavan over 15 years ago. I must admit that I learned more about Krishna and Hinduism in 20 minutes conversation with her than from a few books I read prior to my visit to India. I guess, Hinduism requires a personal touch. Vrindavan had so many more temples to see (Banke Bihari Temple, Sri Radha Raman Mandir, Rangji Temple and of course, the famous Govind Dev Temple built in 1590), but because we were time constrained, we optioned to drive to Mathura instead of waiting for 4 hours for all other temples to open. Mathura is a birth place of Lord Krishna (who is the 9th re-incarnation of god Vishnu) and one of the Hinduism’s seven holy cities. The city is ancient and it was mentioned in the oldest India epic, the Ramayana, dating back to 1,600 BC. Just like in Varanasi, where everything is centered around Lord Shiva, in Mathura, everything is about Krishna. Even though there is a large temple (Shri Krishna Jamna-Bhoomi) built in order to commemorate the place of Krishna’s birth (a prison cell, to be exact), there are, in fact, a few places that have a claim for his birth – Dwarkadheesh Temple near the Ghats is one of them. 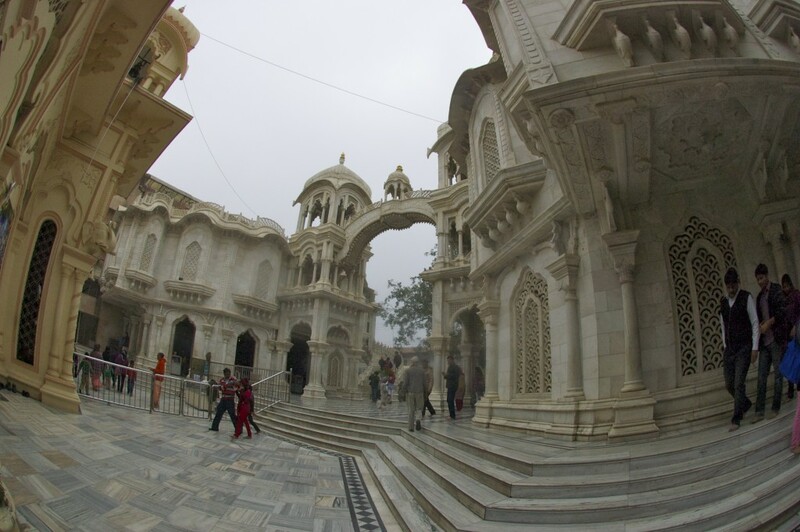 At first, we wanted to check out the local Archeological Museum, however, it was closed (Monday); then, we drove to the entrance to the old city and Ghats, where we left the car and walked into the ancient streets of Mathura. As Dimi pointed a few hours later, it felt as if we were walking through a medieval town – the ambience, setting, architecture, people, clothes, merchandise they were selling, curious smiles. 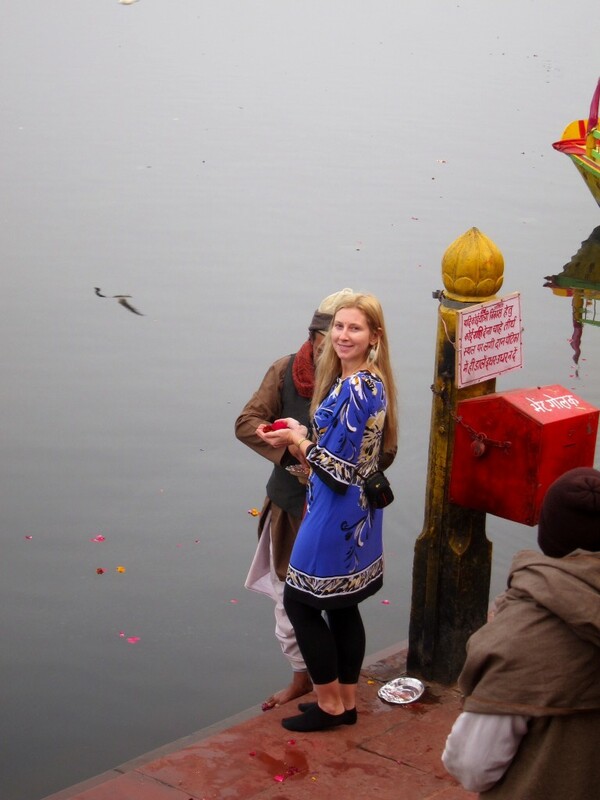 We walked to the Vishram Ghat and I performed my first puja. I was taken by the puja master to the bank of Yamuna River, carrying with me a little pot with flowers, rice, candle and color paste. The master asked me to repeat the words after him, and I did, however, the meaning of the recitation remains a secret to me. At some point, along with chanting, I was ordered to throw the rose petals into the river and set the candle afloat. After marking another tikka on my forehead, the Master rushed to Dimi to demand his Rs.100 for the ceremony. We continued to wander the narrow streets of the city, coming across a beautiful Mosque of Abd-un-Nabi Khan (built 1662) near Chowk. 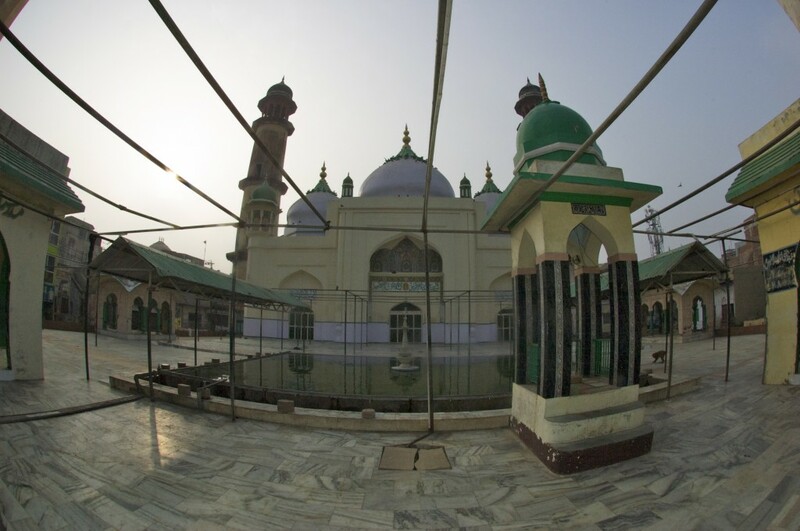 The ground which Abd-un-Nabi Khan selected as the site of his mosque, he purchased from some butchas and the reminder, he obtained from a family of Kazis, whose descendants still occupy what is called Kusk Mahalla, one of the very few quarters of the city that are known by a Persian name. Muslim worshippers sitting near the bazar were kind enough to offer to open the Mosque and show its interior for us. I was stunned. Besides enjoying a leisurely stroll around an ancient city, we visited a few places. Most notably, Dwarkadheesh Temple – the main temple in town built in 1814, Vishram Ghat – a sacred place where Krishna has rested after slaying his uncle tyrant Kansa and a few smaller temples near the ghat. And, Kesava Deo Temple or Krishna Jamna Bhoomi – a relatively new complex built around the prison cell where Krishna was born. It is said, that the first temple here was constructed almost 5,000 years ago by Vajranabha, the great-grandson of Lord Krishna. The next big temple was built here during the time of the Gupta Emperor Chandragupta II around 400 AD. This temple was so grand that it was said that neither painting nor description could describe it. We hired a guide (Rs.100) who was very knowledgeable and informative, making a visit to the prison cell and around the temple not only interesting but also spiritual and mystical. Unfortunately, no cameras were allowed. One day on a road, visiting only two ancient cities, but learning so much along the way. India rewards her fans! This entry was posted in Asia and tagged Chandragupta II, chowk, Delhi, Dwarkadheesh temple, Four Wheel Drive, god, Hare Krishna, Hinduism, India, ISCKON, Jama Masjid, Khan Market, Krishna, Krishna Balaram Temple, Krishna birth place, Lord Kishna, Maa Vaishno Devi Ashram, Mathura, Mathura museum, Mosque of Abd-un-Nabi Khan, puja, Radha Krishna, Ramayana, Reciclar, Shiva Ganga express, Shri Krishna Jamna Bhoomi, Swami Pradhupada, transcendental, tripadvisor, Trolleys, Varanasi, Vishram ghat, Vrindavan, Yamuna. Bookmark the permalink. ← Varanasi, India. December 2013.